Spoiler alert! Do not read this unless you want to read something key to the plot!!! I feel like I have been reading about or hearing about this movie for months and I finally got to see it this weekend. I'll start off letting you know that it lives up to the reviews. It is one of the most brilliantly written and acted movies I have seen in years. I found myself getting incredible buy-in with these characters. 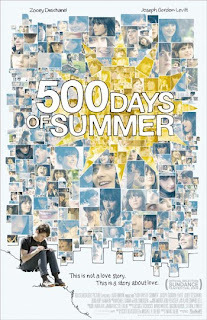 You find out right at the start (through the magic of narration) that Tom (Joseph Gordon-Levitt) and Summer (Zooey Deschanel) do not end up together but you can't help but hope that this is a lie. It is not. Summer's reasons for ending up married to someone else before day 500 even arrives is never completely made clear and that's just like real life. Some relationships just end. You wake up one day and it's over for you and that's exactly what happens here. There is no real explaining it but there also is no turning back. Once you've hit that point with someone (and you know, dear reader, that you too have been there), it's over. Zooey Deschanel was brilliant as Summer but it is Joseph Gordon-Levitt's performance that lingered with me as I left the theater. His pain at what was happening and his complete lack of control over the situation was haunting and I felt like I was back in time watching relationships implode again and again. Some of those memories played over in my head as I watched this. It was raw and emotional and definitely will be a hallmark performance for him. This all said, this is not the movie you would want to take a date to. You will find yourself analyzing your entire relationship afterwards. It was bad enough going with the person I have been married to for 13 years. It made me rehash all kinds of old memories and made me question every dumb thing I did relationship-wise (and I could write volumes on that subject). Not only did I wonder about all the screw ups I made in the past but I wondered what I was doing now that was screwing things up without me even knowing it. It was quite a downer - a brilliant movie - but a downer. I will not buy the DVD. I don't want to put myself through that sort of self-introspection again. I did buy the soundtrack which is quite good. It's a must see but consider yourself thoroughly warned.